Simon & Schuster, 9781476764795, 368pp. The untold story of the global poor: “Powerful, lucid, and revelatory, The Great Surge…offers indispensable prescriptions about sustaining global economic progress into the future” (George Soros, chairman of Soros Fund Management). We live today at a time of great progress for the global poor. Never before have so many people, in so many developing countries, made so much progress, in so short a time in reducing poverty, increasing incomes, improving health, reducing conflict and war, and spreading democracy. Most people believe the opposite: that with a few exceptions like China and India, the majority of developing countries are hopelessly mired in deep poverty, led by inept dictators, and have little hope for change. But a major transformation is underway—and has been for two decades now. Since the early 1990s more than 700 million people have been lifted out of extreme poverty, six million fewer children die every year from disease, tens of millions more girls are in school, millions more people have access to clean water, and democracy—often fragile and imperfect—has become the norm in developing countries around the world. 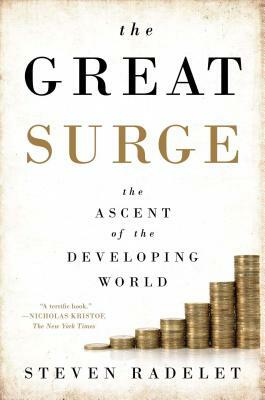 “A terrific book” (Nick Kristof, The New York Times), The Great Surge chronicles this unprecedented economic, social, and political transformation. It shows how the end of the Cold War, the development of new technologies, globalization, and courageous local leadership have combined to improve the fate of hundreds of millions of people in poor countries around the world. Most importantly, The Great Surge reveals how we can accelerate the progress.